Thea Landen: Second Skin is Out Today! Second Skin is Out Today! It's here! I'm still in love with this cover, and I like to pretend I look like this when I wear my sunglasses (let's ignore my actual picture over there somewhere to the right...). I mused about this story for a bit over at the official 1 Night Stand blog, so be sure to check it out! “It’s beautiful out here, isn’t it?” His breath danced across the tip of her ear. Anguish stabbed at her. The images he described sounded flawless and enticing. Every part of her yearned to agree to whatever he offered, but planning a rendezvous posed too much of a risk. She hadn’t predicted the difficulties of keeping up an ongoing charade with the man she met. 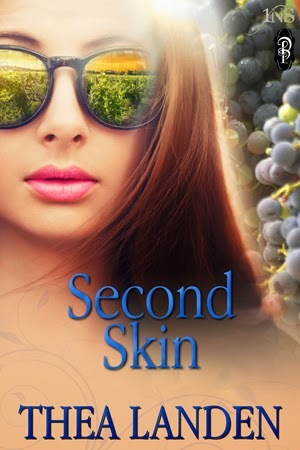 Second Skin is available from Decadent Publishing, and can also be found on Amazon, B&N, and All Romance!